Are you in your own little world, or are you part of the big world around you? If you’re like me, it’s a balance of both. Instead of a caption, I’ll just put a link to the Weeds theme song. their cars, private properties and even in public space – when a face in glued into a device instead of looking around. I’m guilty of this. 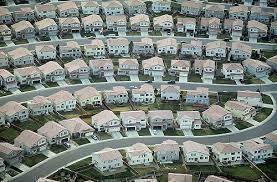 Chances are, you don’t know all your neighbors and don’t particularly care. Personally, I’m even more isolated. I live on a 32-ft. sailboat with one other person and a cat. That’s it. My neighbors change almost every day, except for when we need to stay in a certain place to hide out for hurricane season or to make money. Even then, it’s not necessarily an easy task to reach out to others. In more populated boating communities, there are “Cruiser’s Nets,” which are weekly, open information sharing at a specific time. And sometimes it’s obvious that the other person at the café is a fellow “boat person” by their dress and demeanor, so it’s easy to strike up a conversation. But overall, it’s just my own little world on S/V Tortuga. I write. I practice Yoga on deck. I pet my cat, and I read. Sometimes my mate and I will play music or listen to NPR or a podcast. I work. I meditate. Like I said, my own little world. I think they Photoshopped this, because it was impossible for us to get this on film. But it’s kind of like how it is: magical! and possibly the world. It is nothing short of spectacular. Puerto Mosquito (where, let it be known, I saw not one mosquito) is a small body of water opening up to the ocean that happens to be filled with dinoflagellates. Those are tiny microscopic critters that, like a firefly, emit a glow when touched. We anchored in it the other day and took the dinghy through the shallows into the depths of the bay, where we jumped in under the dark of night. Immediately, every splash translated into a fiery strike of light neon green that created trails for the delight of our eyes. I could make water angels with the glow. When my head came emerged from underwater, sparkles remained on my skin and mirrored the stars in the clear sky. There were thousands of points of light everywhere there was movement. Life was everywhere around me, there was no doubt about it. 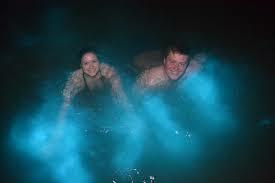 I experienced a bioluminescent bay before, last time I traveled to Puerto Rico with a friend. We were lucky enough to grab a last-minute opening on a kayak tour for $50 each of another bay near Fajardo. Traveling to Vieques was tricky without a boat because the ferry departs before dark, meaning the hotel we had already booked for the week would have gone to waste. Even though the bay wasn’t as bright and I was accompanied by more than a hundred other excited tourists, I still talked about it to anyone who said anything about Puerto Rico. But that was nothing. Swimming with just one other person made it shift my perspective on the world around me. Even when I am seemingly “in my own head” and engaged in my own spiritual development and progress, there is a lot going on. Just look at who screamed light when I moved my arm! Energy and life all around us! And here’s the kicker: we are all connected. 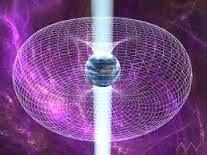 Every single sentient being in the universe is connected. You are connected to the little dinoflagellate guy who glowed because you read this blog. (Hey, thanks!) I am connected to your mailman who you waved at this morning, too. It’s more than the “Six Degrees of Kevin Bacon.” It’s real. The more we recognize the inter-connectivity of life, the less isolated we will feel and – I suspect – the happier we will be. The more friends we will have (no matter how tiny, right little dino dude?) and the more we will smile. I know I was certainly smiling when I saw so many beings lighting up just at the touch of my presence. I understood how powerful touch is … imagine if we all shined our light like that! Maybe instead of bothering the dinoflagellates, I was hugging them? Petting them? I hope so (although really I doubt it). Because I can never have enough hugs. Let’s share one now!